When I was young, I wanted to be a detective for the longest time ever. This vocational pursuit sprung mostly from my voracious reading of any mystery book I could get my hands on at the small local or school library. As a wannabe Sherlock Holmes, I was naturally fascinated by codes, their cryptic vocabulary and stealthy ways of passing secret messages. I read up a great deal on secret code languages and even attempted to develop one of my own that I could share with a select group of close friends. Perhaps that explains why I was so fascinated to learn about QR codes, which have been all the rage over the last year. Quick Response Codes, as they are called, are those little black and white squares that resemble patterns of tetris game. QR codes were invented in Japan in the 1980s and have been popular in Asia for a while. 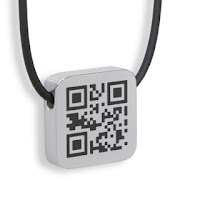 They can be scanned by a QR code reader on your mobile phone and linked to a Web page, text, phone numbers or SMS. QR codes can be generated for free by a number of websites such as Kaywa or QRStuff. Lady Gaga posted this QR code on her Facebook page so fans could download her latest 'Born This Way' ringtone. The best feature of QR codes is that they act as a bridge between the online and offline world. One of the biggest disadvantages of print or outdoor advertising has been the inability to measure results. QR codes, to some extent, help solve that problem because they make it easier to measure how many people not only saw the ad but also acted on it. ﻿﻿﻿One of the most promising examples of QR code campaigns I’ve seen recently is to use it as a channel for some clever story-telling that creates better engagement and connects the end consumers with the makers of a product and the product's story. The IOU Project by a Madrid-based designer named Kavita Parmar, allows buyers to scan QR codes and see (through videos and pictures) the entire story of how their unique hand-crafted product was made -- from the artisans in India who wove the fabric to the designers in Europe who created the garment. Buyers also have the option of uploading a picture of themselves using or wearing the garment, allowing them to connect with the designers and craftsmen who created their product. John Fluevog Shoes is another great example. Each of their handcrafted shoes from the Ask Clogs collection has a unique QR code that links to a video of that item being made from start to finish. I think these are both fantastic examples of the use of QR codes. Isn't this the very essence of what we try to achieve through social media tools -- greater engagement, deeper consumer connections with the brand and a more interactive experience that allows people to really relate to the brand and become passionate advocates? Have you seen any great social media campaigns executed through QR codes? Share them in the comments section below. Things where QR Codes are involved are really a lot. On this website you can insert message, social network link, email and many other in the QR code integrated on the t-shirts.